HERE’S a little project that’s sure to keep the youngsters amused for hours and hours. About 9″ from head to tail, this busy balsa “bee” will blink continuously for over a year on one set of batteries. 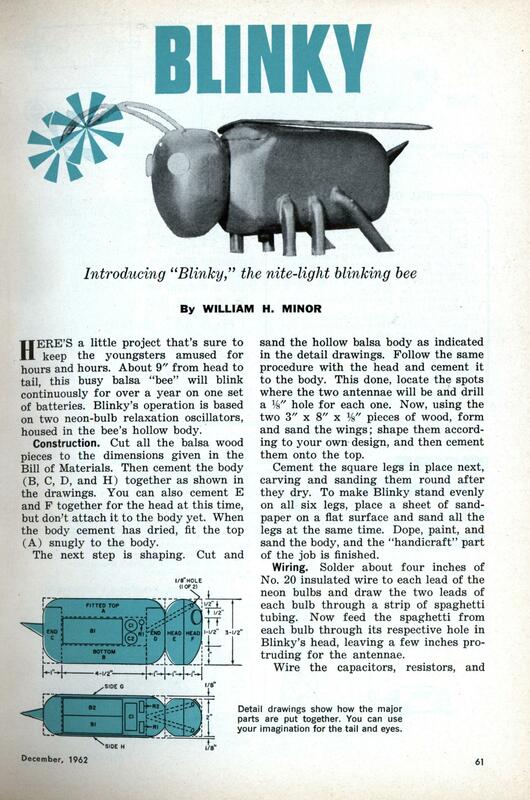 Blinky’s operation is based on two neon-bulb relaxation oscillators, housed in the bee’s hollow body. Construction. Cut all the balsa wood pieces to the dimensions given in the Bill of Materials. Then cement the body (B, C, D, and H) together as shown in the drawings. You can also cement E and F together for the head at this time, but don’t attach it to the body yet. When the body cement has dried, fit the top (A) snugly to the body. The next step is shaping. Cut and sand the hollow balsa body as indicated in the detail drawings. Follow the same procedure with the head and cement it to the body. This done, locate the spots where the two antennae will be and drill a 1/8″ hole for each one. Now, using the two 3″ x 8″ x 1/8 pieces of wood, form and sand the wings; shape them according to your own design, and then cement them onto the top. Cement the square legs in place next, carving and sanding them round after they dry. To make Blinky stand evenly on all six legs, place a sheet of sandpaper on a flat surface and sand all the legs at the same time. Dope, paint, and sand the body, and the “handicraft” part of the job is finished. Wiring. Solder about four inches of No. 20 insulated wire to each lead of the neon bulbs and draw the two leads of each bulb through a strip of spaghetti tubing. Now feed the spaghetti from each bulb through its respective hole in Blinky’s head, leaving a few inches protruding for the antennae. Wire the capacitors, resistors, and batteries, and connect the leads of the neon bulbs as shown in the schematic diagram. The bulbs should start to blink immediately at the rate of one per second. (Due to the limited amount of space in Blinky’s hollow body, C1 and C2 should not exceed 3/4″ in diameter and l-1/2″ in length, while Rl and R2 should be no larger than 1/4″ in diameter and 3/4″ in length.) Finally, place the batteries and other electrical parts carefully into the body cavity, and install the top. Don’t worry about an “on-off” switch—the balsa bee will continue to blink for the shelf life of the batteries. Yikes, that circuit… how long until transistors and light-emitting diodes are invented? My favorite are the 67.5 volt batteries, which aren’t exactly in the checkout lines of every grocery store. Actually, these were “B” batteries used to supply plate voltages for vacuum tubes. You can still buy them at Radio Shack, it turns out. LEDs were introduced in 1962, but they were probably out of most hobbyists’ price range. 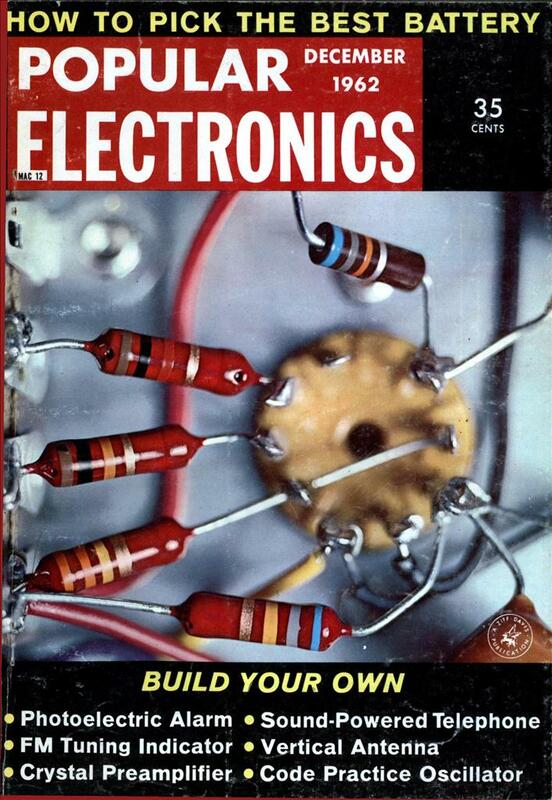 Transistors were certainly available, but there was no need for a complex circuit when using the neon lamps. With transistors you wouldn’t need those giant caps and resistors! So, the caps charge up, the neons fire and drain them to the extinguish point, then it goes round again…and again. Even in 1962, I doubt this would keep “youngsters amused for hours and hours”. But then, I remember spending whole days driving my minibike at full throttle towards abandoned cars and buildings, jumping off at the last second, and enjoying the carnage. Extra bonus if I got on the bike again before it stalled! Neon bulb relaxation oscillators were a staple in Electrics classes in 1979. The ones we built were hooked up to line power with a fuse. No joke.